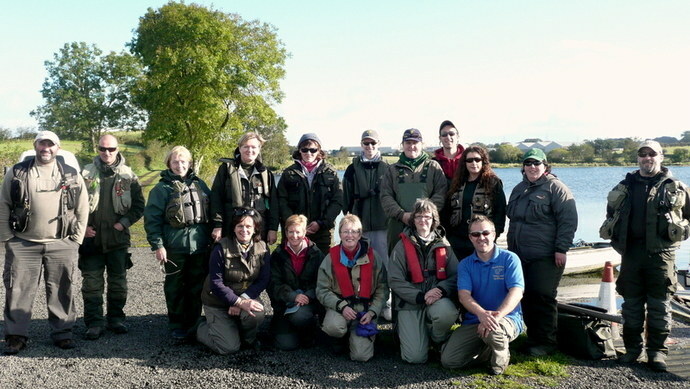 Ten women fished the 4th and final trial of the year at Straid Fishery, near Ballyclare, Co Antrim. We had an excellent day out with hot irish stew, crusty bread and cups of tea for lunch courtesy of Ray and Derek at the fishery. Competition was hot with places for the 2013 Ladies International on Caragh Lake, Co Kerry, in the balance. The weather was kind to us and 37 great rainbows were caught and safely released, with many more lost on the day. Thank you very much to Straid Fishery for hosting us, and to Harry who organised all the boatmen. Such great boatmen made our day even more enjoyable with nothing to do but sit back, relax and enjoy ourselves. Top boatman was Tim Doherty who was kept busy netting 14 fish to his boat.